Wackiest US Roadside Attractions: Which Is Your Favorite? Summer travel planning doesn't start until someone rolls out a map and ticks off their favorite road trip route. Getting out on the open road is so inherently American that it's almost in our blood to yearn for the unexpected attractions and wacky landmarks that pop-up on almost deserted stretches of road. Last week you chimed in with your choices for the most beautiful road trip route, from drives we paid homage to, like the Big Sur Coastal drive and Hana Highway, to roads we temporarily forgot, like your write-in favorites US Route 1 to the Florida Keyes and the Alaskan Highway. In the end, Wisconsin came out strong and the Great River Road Scenic Byway took home the prize. Now that we've settled the challenge for prettiest drive, we want to know where you go for kitsch. What's that one crazy roadside monument you can't drive past without stopping? Are you a sucker for a frontier town, or do you prefer a little fantasy? Or, have we completely left-off a strange old favorite, like the infamous South of the Border, that you feel still deserves some recognition? 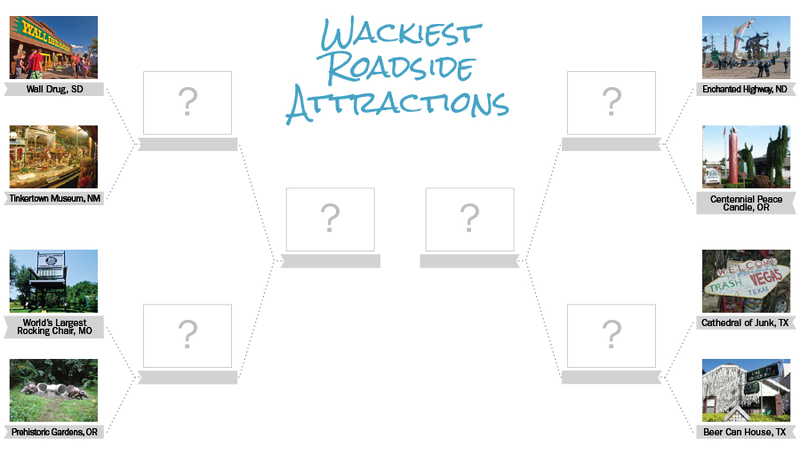 Vote below for your favorite roadside attraction below and leave a comment to tell us why your choice should be on everyone's summer itinerary. Voting on this round has been extended into Wednesday. Be sure to follow @HuffPostTravel on Twitter and Facebook to find out which spots have a special place in our hearts. And follow all the overlooked attractions, prettiest drives and spookiest cemetery winners by following our US summer destinations headquarters. Photos: Wall Drug, TravelSD.com; Tinkertown Museum, New Mexico Tourism Department; The Enchanted Highway, North Dakota Tourism/Scooter Pursley; Centennial Peace Candle, City Of Damascus; World's Largest Rocking Chair, Wikimedia Commons; Prehistoric Gardens, Oregon Coast Visitors Association; Cathedral of Junk, Fuzzy Gerdes/Flickr; Beer Can House, Greater Houston CVB.